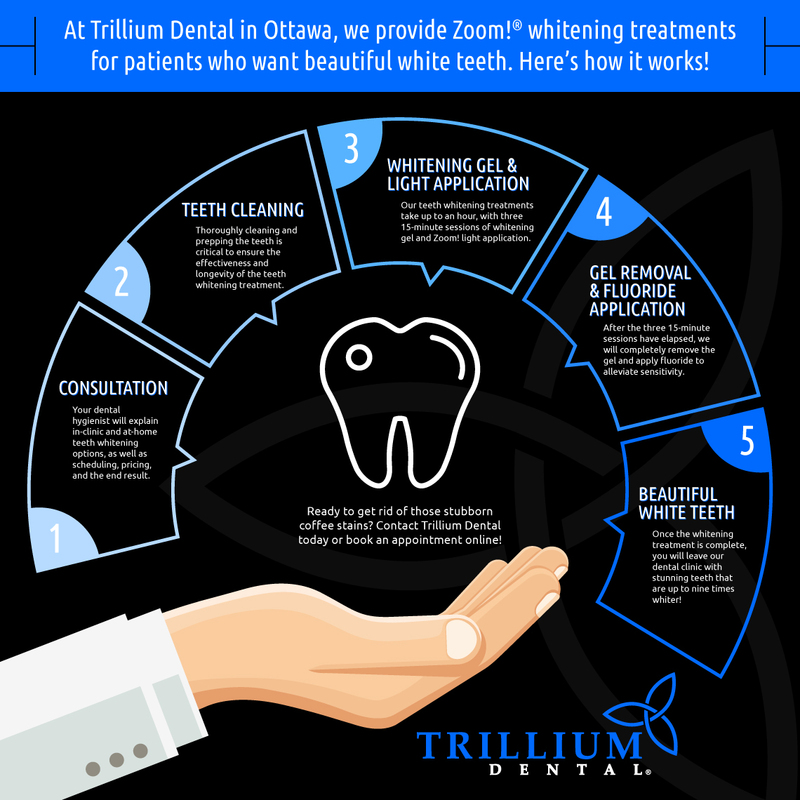 At Trillium Dental in Ottawa, our goal is to help each and every one of our patients attain their perfect smile — and for many, this means scheduling a teeth whitening service at our dental clinic. As it turns out, yellowing teeth are a major contributing factor to low self-esteem, which can be remedied in just an hour with a professional teeth whitening treatment. But before we dive into the benefits and process of teeth whitening as well as our Zoom!® whitening treatments and take-home teeth whitening kits, here is a little more information about us! Trillium Dental is a family dental clinic that provides comprehensive dental care for people of all walks of life, no matter where they come from or what their financial situation looks like. With a multilingual staff at each of our eight dental offices throughout Ottawa, it is our mission to serve the local community with the exceptional dental services and genuine patient care they need to maintain optimal oral health. For us, dentistry is much more than just a profession — we treat our patients like family and consider it our duty to provide them with the best dental experience they’ve ever had. With us as your trusted family dentist, there is no need to dread your biannual teeth cleaning appointments, dental X-rays, or any other kind of dentistry procedure for that matter. As dental patients ourselves, we know how nerve-wracking going to the dentist can be, and we do everything in our power to make your dental appointments a breeze. You’ll find that our dental clinic is comfortable, warm, and full of friendly dental professionals who get to know you on a personal level in order to provide the best dental care possible every time you visit. If you are looking for an family dentist in Ottawa that you can trust, Trillium Dental is here for you. Contact us today or request an appointment online if you are due for a professional teeth cleaning, are concerned about your oral health, or are interested in any of our cosmetic dentistry procedures. In the meantime, continue reading to learn how our Zoom! teeth whitening treatments work! Before proceeding with any kind of dental treatment, your dental hygienist will sit down with you in order to form a personalized plan of action. For Zoom! whitening patients, this includes a brief discussion about what the teeth whitening treatment will entail, how much it costs, what results to expect, and how we can cater the treatment to your own unique needs. In order to effectively bleach teeth with Zoom! whitening gel, your hygienist will first clean your teeth. This allows the teeth whitening gel to act directly on the tooth surface as opposed to any existing plaque and bacteria. Like painting on a blank canvas, this preparation greatly enhances the gel’s effectiveness and long-lasting end result. After cleaning the teeth, we will prep your lips and gums so they don’t get Zoom! gel on them during the teeth whitening treatment. Then we will carefully apply the first coat of teeth whitening gel to the surface of your teeth and shine the teeth whitening light on them for 15 minutes. We will repeat this two more times while you relax and watch TV or listen to your favorite tunes. Once the 45 minutes is up, your dental hygienist will remove the teeth whitening gel completely and apply a special kind of fluoride to help with any tooth sensitivity you may be experiencing. We will also send you home with aftercare instructions to ensure that the teeth whitening treatment lasts as long as possible. Immediately after leaving our Ottawa dental clinic, your teeth will be up to nine shades whiter than they were before, with possible increased whitening over the next few hours. The beauty of Zoom! whitening is that we can customize the treatment so the result reflects your preferred shade of brightness to the best of our ability — meaning that you won’t leave with blinding white teeth if that isn’t the goal. Ready to get the pearly white smile you’ve always wanted? Give us a call today to discuss our in-clinic teeth whitening treatments and options for teeth whitening at home, or read on to learn about the benefits of teeth whitening treatments! Teeth whitening treatments are a great way to boost your confidence and self-image when your favorite foods and drinks (and bad habits) have taken a toll on the appearance of your teeth. If you love coffee, tea, red wine, soda, sweets, or dark fruits, or if you smoke cigarettes or chew tobacco, your teeth will likely show it as they begin to stain over time. The good news is that teeth whitening gel can combat this, leaving your teeth up to nine shades whiter after every treatment. The benefits of professional teeth whitening include the following. As previously mentioned, discolored teeth are a big deal for a lot of people — and for good reason. Your smile is one of the first things others notice about you, so it makes sense that you’d want your pearly whites in tip-top condition at all times. Unfortunately, many people who have yellowing teeth tend to feel down about themselves, are more uncomfortable in social situations, and lack confidence in their smile, leading them to hide their teeth at all costs. If you are one of these people, you certainly aren’t alone — and luckily, this doesn’t have to be the case. Professional teeth whitening treatments offer an immediate solution that drastically improves the appearance of your teeth after just one visit to your local dentist. So rest assured that you’ll leave the dental clinic feeling much happier and more confident in the appearance of your teeth than you were earlier that same day! Not only can professional teeth whitening treatments greatly improve your confidence and self-esteem, but they also enhance your overall appearance in the process. Studies show that having your teeth whitened can make you more attractive by 20 percent or more, and that white teeth can enhance other features like the color of your eyes, your skin tone, and your hair. People with white teeth are also more likely to be perceived by others as younger, healthy, clean, friendly, happy, and successful — giving them an advantage in both their social and professional lives. While we all share a common desire to come across this way, what’s really important is the way we perceive ourselves. We’ll be the first to say that nothing compares to looking in the mirror after a professional teeth whitening treatment and feeling fully confident in your smile. When you are happy with your own appearance, nothing will stand in your way of smiling in family photos, belly laughing with your friends, or feeling confident in a job interview. A major perk of professional teeth whitening treatments is that they can be completed in a very short amount of time — an hour or less in many cases. At Trillium Dental, we apply Zoom! whitening gel in three 15-minute sessions and shine a special teeth whitening light on the area to maximize the effect of the teeth whitening gel as it goes to work dissipating stains and discoloration. Once this quick, three-part treatment is complete, you will walk away with a beautiful smile that is up to nine shades whiter than when you first walked in to our Ottawa dental clinic! In addition to being incredibly efficient, professional-grade teeth whitening gel is also painless when applied by an experienced dentist who knows exactly how much to apply, where to apply it, and for how long to leave it on. All too often, people try to save money by ordering teeth whitening kits online, only to experience a great deal of pain when the gel is misapplied and smears all over their gums. This is part of the reason why it’s worth it to leave the work to the professionals — they whiten teeth nearly every day and have the knowledge and experience to do so painlessly every time. That being said, we do offer take-home teeth whitening kits here at Trillium Dental for those who prefer to do it themselves, but you can count on us to give you instructions for how to do it properly so you don’t get hurt. Professional teeth whitening treatments also yield long-lasting results — a difficult feat for those who order teeth whitening kits online or buy teeth whitening strips at their local drugstore. The reality is that these cheap teeth whitening products often lack effectiveness, and if they do work, the results usually don’t last long. That’s why it’s best to approach cosmetic dentistry as an investment — you truly get out what you put in, and your dentist will have the best teeth whitening options for you. At Trillium Dental, we only use advanced Zoom! whitening technology with activated teeth whitening gel and an LED teeth whitening light. When applied properly by your trusted family dentist, this combo exponentially increases the effectiveness of the teeth whitening gel as it breaks down stains on yellow teeth. Most patients who have their teeth whitened at our dental clinic report results lasting between a year and 18 months or longer. Of course, this depends on your oral hygiene routine at home, so be sure to brush and floss as recommended while avoiding teeth-staining foods. Teeth whitening gel technology has come a long way in recent years, which has made teeth whitening treatments far more accessible and affordable than they ever have been. No longer do patients have to go out of their way to find a dentist who specializes in teeth whitening treatments — in fact, most dental clinics nowadays offer teeth whitening services as one of their cosmetic dentistry options. Plus, it never hurts to check and see if there are financing options available or if your insurance covers a portion of the treatment. While it is still considered a cosmetic investment, professional teeth whitening treatments aren’t nearly as expensive as many other aesthetic enhancement options available today. Things like plastic surgery, Botox®, eyebrow microblading, microdermabrasion facials, and various salon treatments such as lived in hair coloring and eyelash extensions that cost hundreds or thousands of dollars. With professional teeth whitening treatments, you make a one-time payment and get exactly what you pay for, when you pay for it. Another major benefit of having your teeth whitened is the improved oral health routine that often follows. While our dentists and dental hygienists strongly advocate for the importance of maintaining good oral hygiene at all times, we also understand that it can sometimes take a significant investment in cosmetic dentistry to put you back on track. After all, you wouldn’t want to spend the money to have your teeth whitened only to stop brushing or flossing as much as you should a week or two later. Now that you know more about the benefits of teeth whitening and how our in-clinic Zoom! whitening treatments work, it’s time to book your appointment at Trillium Dental in Ottawa! Feel free to contact us with any questions you may have about our professional teeth whitening treatments and the options we provide for teeth whitening at home. We look forward to helping you achieve a beautiful white smile!